John Forbes Watson, 1827-1892. Journal of Indian Art, Vol. III, no. 25, 1890. Dr. John Forbes Watson (1827-1892) was a British physician who initially, from 1850, worked for the Bombay Medical service. In 1858 he was appointed Director of the The India Museum in London, and Reporter for the Products of India at the India Office. He held the appointments until 1879. He was involved in the Indian sections of International Exhibitions held in Europe, including London 1862, Paris 1867 and Vienna 1873. During his work for the India Office and the India Museum, he developed the idea of a ‘portable industrial museum’, which led to the publication of the Collections of the Textile Manufactures of India (first series 1866, second series 1872-1877; London) and its companion volume, The Textile Manufactures and the Costumes of the People of India (1866; London). 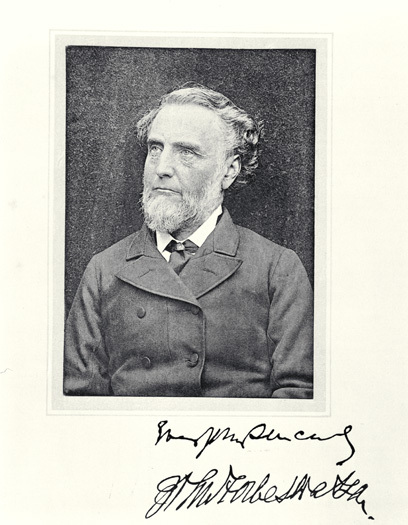 Together with John William Kaye he edited Meadows Taylor's People of India, re-published by the India Museum in London (1868-1875). John Forbes Watson was also involved in the development and categorisation of different types of cotton, which led to information as to which cotton was easy to gin and which was not. See also the TRC Needles entry on The India Museum. WATT, George (1889-1893). A Dictionary of the Economic Products of India, 4 volumes, Calcutta: Superintendent of Government Printing, p. 157.
https://books.google.nl/books?id=ZihOAgAAQBAJ&pg=PA157&dq=dr.+forbes+watson+india&hl=nl&sa=X&ei=fZqmVMntOMWvPPKGgIAJ&ved=0CC8Q6AEwAg#v=onepage&q=dr.%20forbes%20watson%20india&f=false (retrieved 1st May 2017). Digital source of illustration (retrieved 1st May 2017).